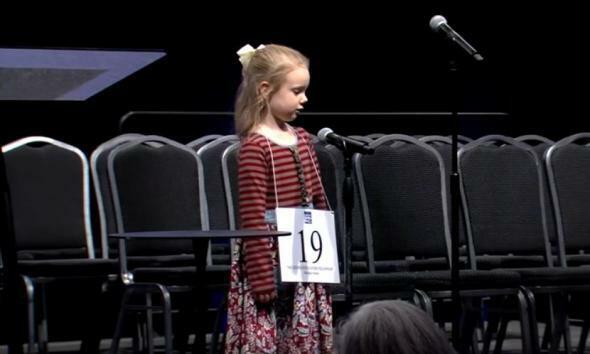 Edith Fuller, 5, will be youngest National Spelling Bee contestant ever. Edith Fuller, 5, beasting the Green Country Regional Spelling Bee in Tulsa, Okla.
Spelling bees have long been one of our nation’s most important sources of adorableness. A multiethnic gathering of tiny nerds, carefully reciting long words letter by letter into adult-size microphones—sometimes with a lisp? Step aside, Westminster Dog Show, you are never going to out-cute the Scripps National Spelling Bee. But if you think the bee has already reached maximum charm, you haven’t met Edith Fuller. She’s five years old, she’s wearing a fancy white bow in her hair, and she knows how to spell “sarsaparilla,” “zephyr,” and “chauvinism.” And she just became the youngest person in history to qualify for the annual cute-a-thon in Washington, D.C. The Scripps bee is the big bee, the Spellbound bee, the bee whose final rounds are broadcast on ESPN. The process, which is open to children through eighth grade, starts with thousands of school competitions all around the country whose winners then progress to local and regional feeder events. Edith is heading to Washington because she won the Green Country Regional Spelling Bee in Tulsa, Okla.
Edith won the Tulsa event by correctly spelling 37 words, culminating in “jnana,” a Sanskrit-origin word for “knowledge,” appropriately enough. Luckily, a local TV station was there to document her victory. Watch her try to restrain her smile as she gets ready to spell “buddha.” Enjoy the shots of her quietly sitting next to competitors who are practically twice her size. Melt as she flounces back to her seat after she nails “minaret.” “Will you please give me the definition?” she asks before each new challenge. “Will you please give me the language of origin?” By the end of the five-hour event, she had vanquished more than 50 older competitors. The next step is a family trip to the Gaylord National Resort and Convention Center for the national event, which starts May 30. Edith, who is home-schooled, said she would also like to make time for other fun activities like playing piano and studying animals. In an interview with a Tulsa newspaper, her mother said the family discovered Edith’s aptitude for spelling last summer. Over dinner, the parents were quizzing their children on spelling, and Edith was able to spell “restaurant” without having studied it. Spelling bees have a certain poignancy that, say, a science fair lacks. Being a good speller is like having beautiful handwriting or being an excellent seamstress: It’s impressive, but it’s almost totally unnecessary for most 21st-century adults. If STEM is the future, spelling feels like the past. But no matter the fate of spelling in the age of spell-check, it would be a mistake to assume that spelling competitions are going away any time soon. Way back in 1910, the New York Times was reporting that stylish hostesses were putting on “old-time frolics” where “boys and girls in old-time dress spell each other down with as great enthusiasm as ever did young folk fifty years ago.” If spelling bees have been retro fun for more than a century, they’re not going anywhere anytime soon—especially with champions like Edith Fuller to keep them young.